Preheat the oven to 350°. Bake the shelled pistachios until really fragrant and just starting to brown, about 5 – 6 minutes. Watch your nuts carefully; they can go from pleasantly golden-ish to a hot mess in seconds. Set aside to cool, then whiz in a food processor until they resemble a coarse meal. While you’re babysitting the pistachios, bring a large pot of water to boil for the pasta. Chop your broccoli while you are waiting for the water to boil and set aside. Once the water is at a boil, add a handful of salt and the pasta and boil until the pasta is almost al dente, about 7 minutes. In the last 2 minutes of cooking, add the broccoli. You want tender but not overdone. Drain the whole shebang, reserving 1 cup of the cooking liquid for the sauce. If you aren’t ready to add the pasta back to the pot for saucing at this point, run it under cold water to stop the cooking process. While you are cooking the pasta/broccoli, add the garlic, lemon zest, red pepper flakes and kosher salt to the food processor and grind into a fine crumb. Add the parsley and mint and pulse to process down. With the motor running, slowly drizzle in the olive and sesame oils. Transfer to a medium saucepan and add the reserved pasta water. Bring the watery pesto to a boil and simmer for 2 minutes. 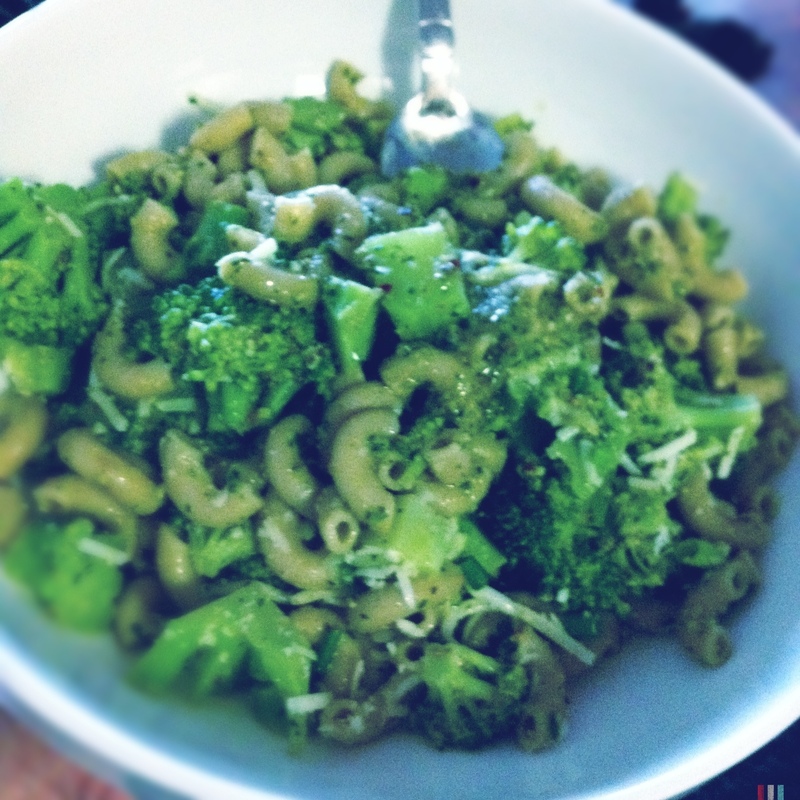 Remove from the heat and add the pasta/broccoli. Stir in the lemon juice and cheese and let sit for 5 minutes to give the lemon a chance to work its magic. Top with the chives and serve. Serves 2 for dinner + 1 for lunch.